Google announces a more uptight version of the Samsung Galaxy S 4 in their annual I/O event and when I say "uptight" I a mean a TouchWiz-less Galaxy S 4 running on a stock Android for USD 649. Being a Nexus-inspired phone, this handset will definitely come without bloatwares and will come with the latest Android 4.2.2 Jelly Bean. And being a Google kid, this phone will receive the latest incremental Android updates without waiting for Samsung to spoil the excitement. Technically, it's still the Galaxy S 4 that we fell in love with - 4.99-inch screen, 1.9 GHz quad-core Snapdragon 600, 2GB RAM, 13MP shooter and LTE-enabled device. Arguably, it's the best reason to go for a Nexus phone. Plus an unlock bootloader will come right out of the box so that you can mix and match that ROMs. 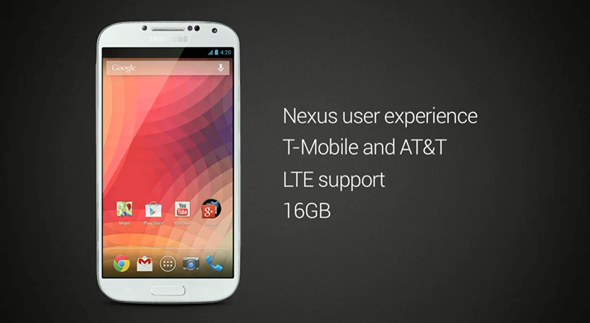 The Samsung Galaxy S 4 Google Nexus Edition will hit the PlayStore in the US on June 26th. And knowing Samsung to be aggressive in their device distribution means that this handset will most likely come in the country soon.